What is the purpose of an FTP? How is an FTP initiated? An FTP begins when a full member ($10K) “FTP Champion” initiates a proposal by defining the requirements for a project. In collaboration with the Consortium staff, the Champion will create a quad chart that captures essential data for the project including a conceptual illustration, scope of work outline, cost, and schedule information. If cost and schedule are not otherwise defined by the Champion or essential performers, SwRI will estimate the cost and schedule for the project. The project is then posted to the consortium web portal, where other members can view the information. With the permission of the potential FTP group members, an FTP quad chart may be directly provided to non-members who may wish to join the Consortium and participate in the FTP. In this way, group members may help to recruit either from within the Consortium, or outside it. In the event that a group member wishes to change or add to the scope of work, this must be negotiated by the fledgling group before the project can start. One possibility to obviate scope disagreements is for a group member to fund a small proprietary project following the FTP, as a means to adapt an FPT outcome to their specific needs. The FTP starts when funding is in place, which may happen at any time during the Consortium year. Consortium meetings are a convenient place to form FTP groups, but they may also form independent of the official meetings. As the Consortium manager, SwRI will receive guidance from each FTP group and will select performers from among its staff and from the Consortium network to perform the work for a given FTP (refer to figure on the right). As a general rule, performers will be selected to maximize the cost/schedule efficiency of the project. This means that SwRI will look to its network of academic partners to perform the work for FTPs that are lower on the TRL (technology readiness level) scale. SwRI will look to outside labs with specialized strengths to perform work that is not otherwise a strong suit at SwRI. An FTP funder may also wish to be involved with software development/testing for rapid technology transfer once the FTP is complete. SwRI is open to hosting visiting researchers/developers from the FTP team (funders or performers), assuming this is approved by the FTP group members. Labor costs for an FTP are divided evenly among participants. In-kind contributions of labor must be approved unanimously by the FTP group. Equipment needed for development or demonstrations is generally loaned to the group by the Champion or by the performers. Though this may involve additional effort or expense for the Champion/performer, the outcome is most beneficial to the one who provides the equipment, since no additional adaptation is required to utilize the outcome. 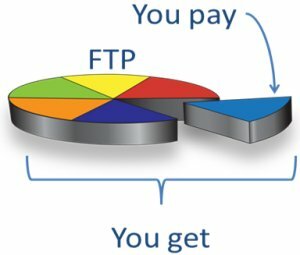 In the event that the FTP divides the cost of equipment (i.e. there is no single owner), a lease arrangement for the equipment will first be pursued. If the equipment must be purchased with FTP dollars, it will remain under the management of the Consortium once the FTP is complete. After the completion of the FTP, any Consortium-owned equipment may be re-purposed for other Consortium activities. Release of source code may be delayed as much as two years after the start of an FTP. In general, any FTP that receives matching funds from SwRI or from a government entity must be made public.